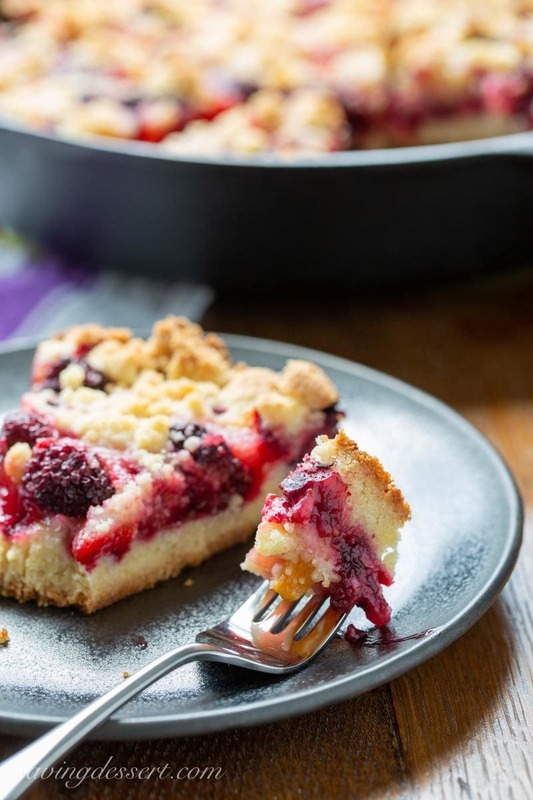 Plum Blackberry Bars – made with a simple shortbread crust, ripe plums, sweet blackberries and a sweet crumble dough. What a terrific flavor combination! I love to eat fresh fruit out of hand but summer fruits and berries are so enticing that every time I buy some for snacking I also buy some to experiment with. I love to create new flavor-packed dessert recipes like this. 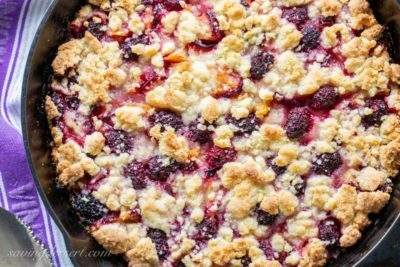 We’ve got lots of crumbles and fruit laden delights here on SRFD, but this new crumble recipe is one of the best so far! The fruit cooks down and turns into an almost jam-like filling that is tart and sweet and so delicious, I’m going to turn this flavor combination into jars of jam! I baked these bars in my 9-inch cast iron skillet, but any similar sized cake pan will do. Square or round, it doesn’t matter. Cut them into wedges or bars, and serve slightly warm with a scoop of ice cream for an exceptional treat. The fruit flavor really shines through on the simple, lightly sweet, shortbread crust. A great texture combination, with pops of flavor in every bite! The crust is firm enough to act as a nice base, so you don’t even need a fork. 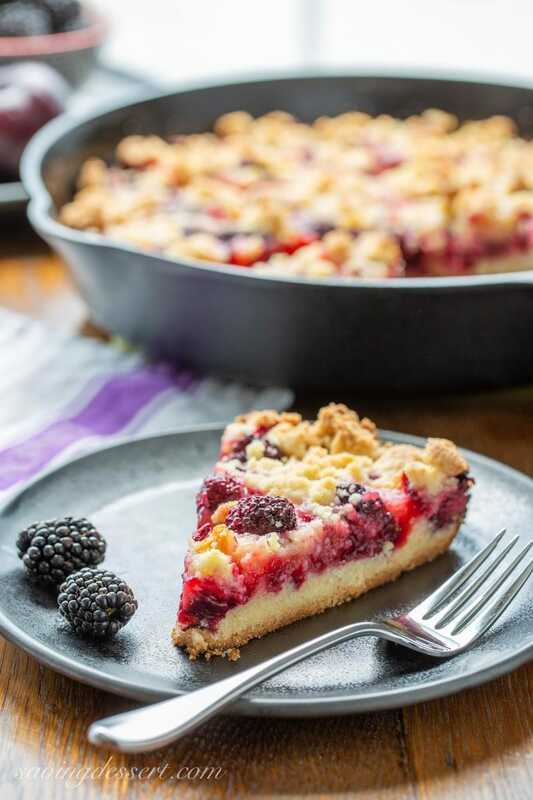 Easy to make and simple to serve, along with fantastic flavor…these Plum Blackberry Bars are perfect for gatherings, pot-lucks, or summer picnics! There’s an old southernism: calling something “plum good.” Translation: this is exceptional! 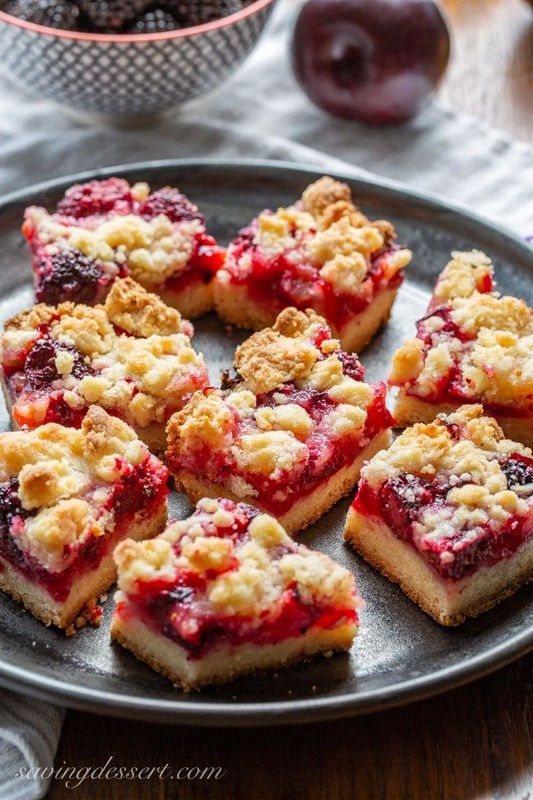 Let me tell you these plum blackberry bars are definitely “plum good!” And…good for you! 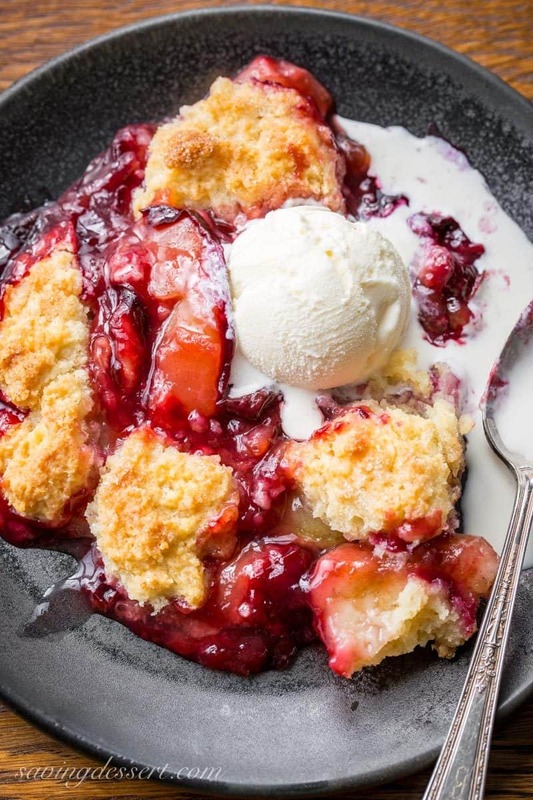 Easy Plum Cobbler – sliced fresh plums topped with a sweet crumbled dough, cobbled together for a quick and easy dessert featuring these delicious, juicy fruits. 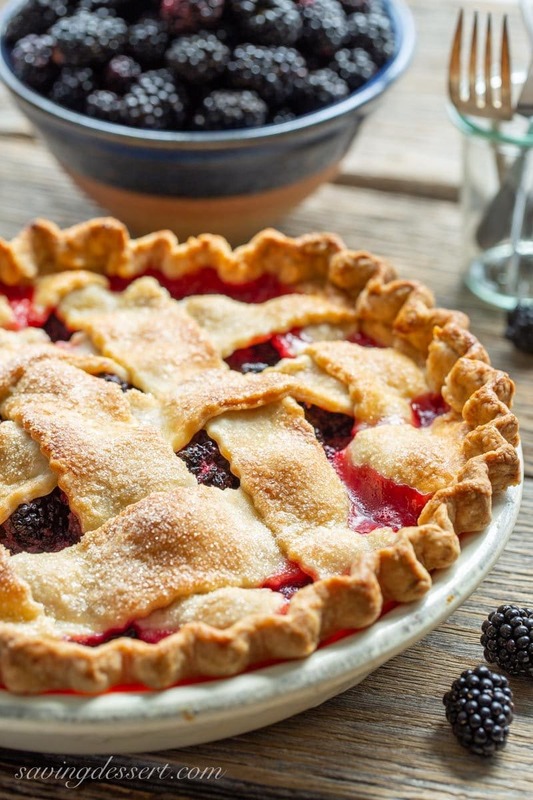 Homemade Blackberry Pie with a buttery, flaky crust and loaded with fresh juicy berries. Nothing says home like a hand crafted pie. 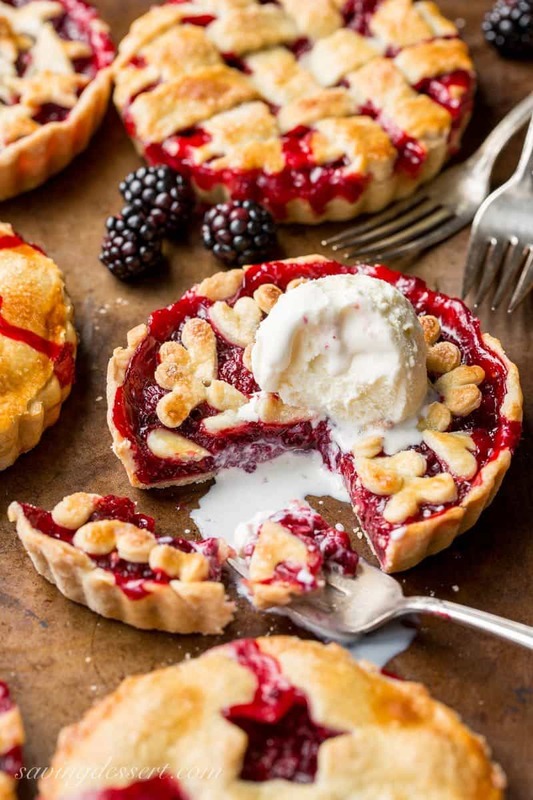 Blackberry Tarts ~ juicy, ripe blackberries nestled in a buttery, flaky crust for an iconic, all American summer dessert. 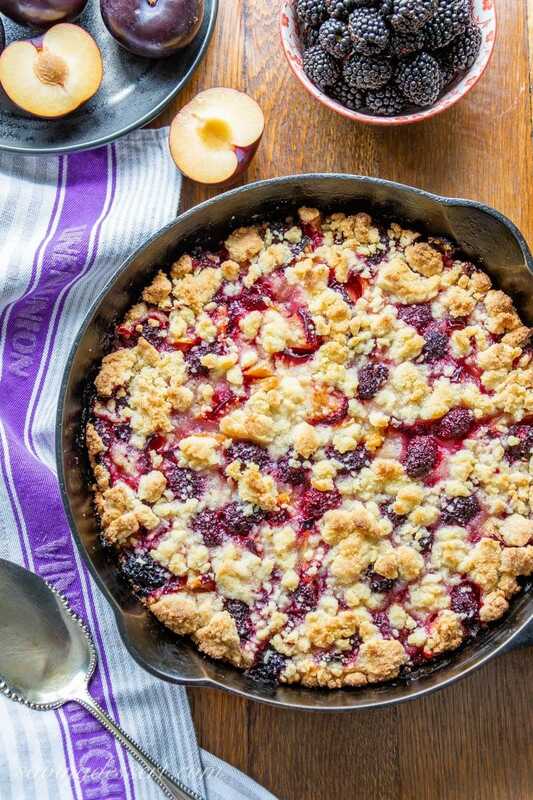 Made with a simple shortbread crust, ripe plums and sweet blackberries and topped off with a sweet crumble dough. Preheat oven to 350F. Lightly grease or spray a 9 or 10-inch cast iron skillet, 9x9 square baking dish or 9-inch round cake pan with vegetable cooking spray. Set aside. In a medium bowl whisk together 1 cup of sugar, baking powder, salt and flour. Add the butter and mix until lightly blended with a rubber spatula or wooden spoon. Add the egg and mix until the dough comes together and all ingredients are incorporated. Gently press two-thirds of the mixture into the prepared pan. Put the remaining dough in the refrigerator. Bake the crust for 5 minutes then remove from the oven to cool slightly. In a large mixing bowl, whisk together the sugar and cornstarch. Add the plums and blackberries and the lemon juice. Fold together using a rubber spatula to combine until all sugar is wet. Pour the fruit over the lightly baked crust and spread evenly. Crumble the remaining chilled dough over the fruit. Bake the bars at 350F for about 40-45 minutes or until the top is just lightly browned and the fruit is bubbly. Remove from the oven and cool to room temperature or serve slightly warm. Cut into bars or wedges and dust with powdered sugar if desired, or serve with a scoop of ice cream. If you purchase something at Amazon after following my affiliate link, I receive a small commission, at no additional cost to you, which I use to pay for web hosting and services for this blog. Thanks for supporting SRFD! You make the most spectacular desserts, Tricia! This looks absolutely heavenly and the crust looks perfect. Me too Jennifer! This is a great combination so I hope you give it a try 😉 Thanks! A beautiful cake like this is often served in Germany. In my village they would bake them on a cookie sheet to feed a large crowd and then serve them with whipped cream. Pinned ! I love your food stories Gerlinde and it’s so interesting how we often bake similar treats all around the world. Thanks so much! 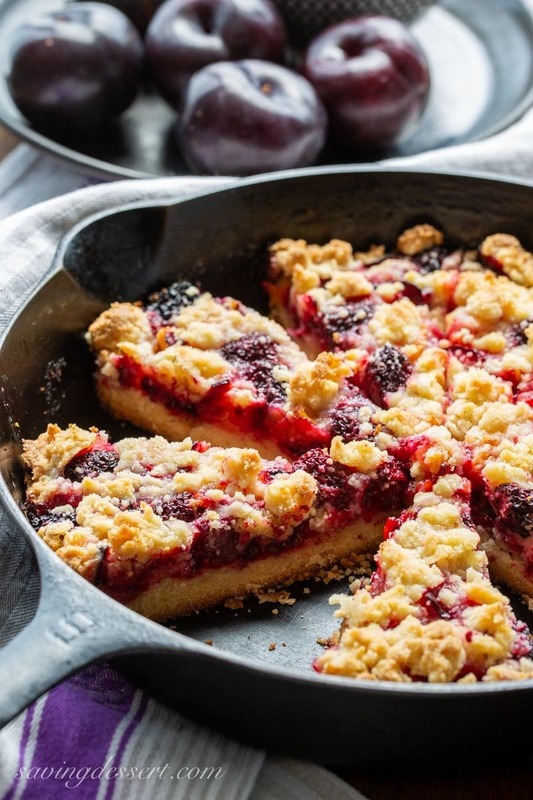 Plum and Blackberry – a match made in heaven! Will be making this to take to a Ladies Morning Tea tomorrow. They’ll think it marvellous, especially as it is out of season here. Fruit all saved in the Freezer!! Yum. Yes, please! What a wonderful summer flavor combination – and, to me, everything is better when there’s shortbread tucked in! Thanks Angie – the crust crumbles nicely, and is not too hard. Almost like a thick shortbread cookies. It’s a nice base for this jammy filling. Thanks again! Me too – thanks Sue! These are gorgeous and would look beautiful displayed on a dessert table. Wondering which brand tart pans are your favorite? Are they the dark nonstick or traditional looking? Sorry Tricia, I was looking at the blackberry tarts when I asked this question! 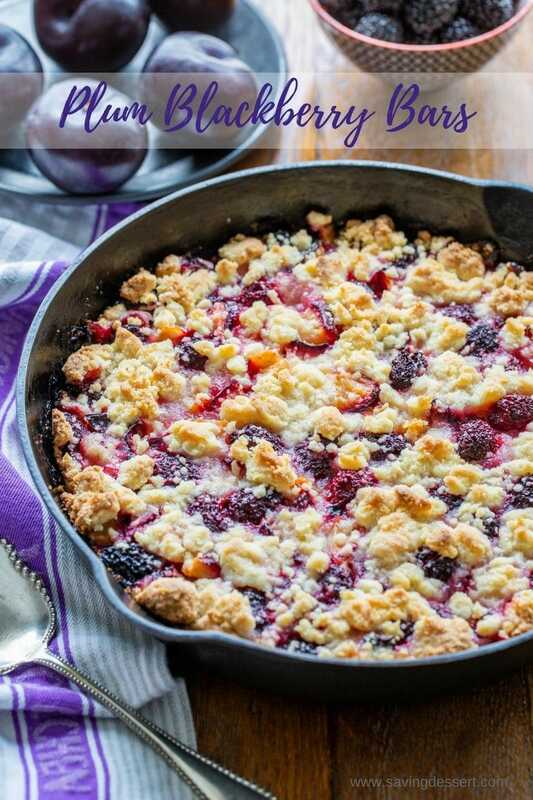 Haha – anything blackberry has my attention – just click over to the recipe and check out the Amazon link at the bottom of the post for info on the pans. Hope you’re having a great week and thanks so much! Hi Julie! I love those little tarts – and had such a great time making them. If you click over to the recipe and scroll to the very bottom of the post, I have an Amazon link to the pans I used. I’ve made a lot of sweet and savory recipes in those little pans. They bake wonderfully and clean up easily. Let me know if you can’t find the link or need additional information. Happy baking and thanks so much!